Peptide hormones perform important biological functions by binding specific cell membrane receptors. For hormone–receptor interaction studies, receptor-binding assays are widely used. However, conventional receptor-binding assays rely on radioactive tracers that have drawbacks. In recent studies, we established novel non-radioactive receptor-binding assays for some recombinant protein hormones based on the ultrasensitive bioluminescence of a newly developed nanoluciferase (NanoLuc) reporter. In the present work, we extended the novel bioluminescent receptor-binding assay to peptide hormones that have small size and can be conveniently prepared by chemical synthesis. 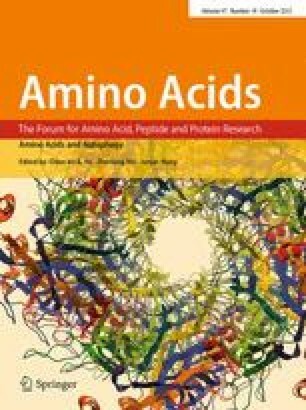 Human ghrelin, a 28-amino acid peptide hormone carrying a special O-fatty acid modification, was used as a model. To prepare a bioluminescent ghrelin tracer, a chemically synthesized ghrelin analog with a unique cysteine residue at the C-terminus was site-specifically conjugated with an engineered NanoLuc with a unique exposed cysteine residue at the C-terminus via a reversible disulfide linkage. The NanoLuc-conjugated ghrelin retained high binding affinity with the ghrelin receptor GHSR1a (K d = 1.14 ± 0.13 nM, n = 3) and was able to sensitively monitor the receptor-binding of various GHSR1a ligands. The novel bioluminescent receptor-binding assay will facilitate the interaction studies of ghrelin with its receptor. We also proposed general procedures for convenient conjugation of other peptide hormones with NanoLuc for novel bioluminescent receptor-binding assays. The online version of this article (doi: 10.1007/s00726-015-2009-y) contains supplementary material, which is available to authorized users. We thank Promega Corporation for providing the plasmids encoding NanoLuc. This work was supported by the National Natural Science Foundation of China (31470767, 31270824) and the Fundamental Research Funds for the Central Universities (2000219098).